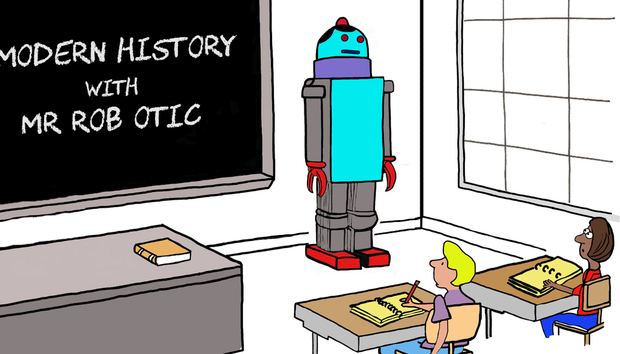 Put aside the fact that most teachers would probably welcome the idea of a robot teaching their class at certain times and think for a minute whether or not it would actually be the right thing to do? Certainly in most educational establishments the role of the teacher is more than just a purveyor of facts. Part social worker, part carer and part psychological mentor, the average teacher generally has a lot on his or her plate but that’s also part of the skill. Could a robot actually do this job and succeed? The whole ‘robots of the future taking jobs’ scenarios are coming thick and fast these days. Back in February, Professor Moshe Vardi of Rice University in the US said that intelligent and semi-intelligent autonomous systems "will march into our society" in the next two to three years. In 30 years most jobs will have been taken over by robots, he says. In 2013 Oxford University academics Carl Benedikt Frey and Michael Osborne released a paper, The Future of Employment, containing a list of occupations with an automation probability score. Teachers of all shades ranked low, except for teaching assistants, which came in with a probability score of 0.56 per cent compared to the number one most likely profession, telemarketers at 0.99 per cent. So maybe it’s not teachers that need to be worried but their assistants? Mathewson is right of course about the synergies between education and technology but he goes on to say that, despite the achievements of current technology, “it’s in no way a replacement for teachers.” Quite right. That’s the key point. How do we use technology, in particular algorithms and machine learning, to improve education and help over-stretched teachers? According to Brazil-based education software business Geekie, the emphasis should be on personal learning, using the technology to achieve something that teachers would struggle to do, given high classroom numbers and varying levels of student competence. Geekie uses data and algorithms to identify gaps in student knowledge and then recommends lessons and activities. This, says the company, allows teachers to identify each student's weakness and monitor their performance in real time. The Geekie platform has been certified by the Ministry of Education (MEC) in Brazil (the only platform to receive this accolade apparently) and now has around 5,000 schools signed up. Of course this is not actually that new. New York-based Knewton has been working on this since 2009 and recently expanded into India. It’s built on the premise that everyone learns differently and at different speeds and that by capturing data and analysing it, teachers can personalise learning. For most teachers this is still a leap. Often constrained by national curriculums, teachers rarely have the time or freedom to explore new methods of working. It would demand school leaders adopt new technologies and here there is usually an issue in that school leaders rarely embrace new technology drives. Either as a result of ignorance or perhaps more likely an over-focussed view on budgets and child performance data, schools seem stuck. Many schools, particularly in Western countries, use data scores to identify improvements, an upward curve that can lead to higher rankings in national league tables and pay rises for teachers. Rarely are they brave in their adoption of new methodologies; it’s just not worth the risk. So what about artificial intelligence then? Surely, given the culture, especially in the UK and US, the algorithmic teacher is an extremely long way off? So how can technology really help now to convince schools that technology can help, not hinder teachers? The time saving and cost saving approach makes sense. It’s an easier way in, so does AI have a future in education? It’s a different take, but an important one nevertheless. Ah yes, fall back on the characteristics that really make us different from the machines. Vedrenne-Cloquette believes educators may have to reinvent themselves as “brain farmers”, transitioning from transferring knowledge to using the fields of neurosciences, learning science and information technology, in order to nurture and stimulate individual growth, content resources, and harvest data on outcomes and efficacy. It’s all good stuff but are we getting ahead of ourselves? Most teachers have trouble logging into their emails or getting decent Wi-Fi coverage. This is a slow burn, regardless of the fact that it perhaps shouldn’t be. The technology already exists to make a good fist at transforming a generally archaic system but that is not the problem. Public policy makers have their eyes on shorter term prizes and it will take a brave leader to ignore the politics and see the longer term value of a revamped, technology-enabled education system.